My passion for horses started in childhood, the first horse I ever rode was an Arabian. I thought they were the most beautiful horses I had ever seen. As a Qatari the Arabian horse is part of my culture, childhood and heritage and I was immediately drawn to them. I decided to follow my dream of competing in equestrian sport, which led to a successful career as member of the Qatar national show jumping team during which time I was honoured to represented my country in many international championships and events. On my retirement from professional competition I joined the Qatar Racing and Equestrian Club as Manager of the Racing Section. In 2006 I was promoted to General Manager of the Qatar Racing and Equestrian Club and Secretary General of the Racing and Equestrian Club Board of Directors, a position I held till 2015. Under my management the Qatar International Arabian Horse Show developed into a festival with 5 days of Shows and 3 days of Racing. The Egyptian Arabian Horse Show was also established and I also added 5 National Shows per year to give the local owners a chance to compete away from the pressures of an international show. During this time the Qatar Racing and Equestrian Club also developed into an internationally acclaimed Racing and Equestrian Centre in the Gulf region and in the world. I was able to start and progress several important initiatives, which continue to enhance Qatar’s reputation as a major supporter of equestrian sport on the global stage. This included establishing ground breaking sponsorships which include the prestigious Qatar Prix de l’Arc de Triomphe, one of the world’s richest races on Turf, the Qatar Arabian World Cup on the same programme and the first ever Group 1 race for pure bred Arabians to be staged on a Classic card in the United Kingdom. In 1999 the State of Qatar played a significant role in the formation of the International Federation of Arabian Horse Racing Authorities. Since its inception I have held key roles within the organization including Chairman of the Rules and Racing Development Committee and Vice Chairman before being elected IFAHR Chairman in 2008, a position I maintain following my re-election for a third four year term in 2013. I headed the Organising Committee for the 2011 WAHO Qatar Conference, which was a great success and attended by many WAHO members. In 2013 the WAHO Conference was supposed to go to Brazil but due to unforeseen circumstances it was cancelled and so QREC was able to step in and I offered to hold the WAHO conference for a second time in Qatar, understanding the importance of WAHO for the Arabian horse and the member countries and I wanted to do everything in my power to let the WAHO family meet as often as possible. 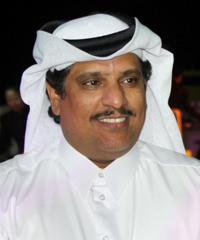 I am currently the Technical Advisor to the Chairman of the Qatar Racing and Equestrian Club. I am also a keen breeder of Arabians, which has led to quite a few promising and exciting racing prospects. I have been a WAHO member since 1998 when I attended the WAHO Bahrain Conference as a Delegate. I was invited to join the WAHO Executive Committee in 2014, an honour which I was happy to accept, I hope that I will continue to bring a great deal of energy and new ideas to this important international Organization.